Set up My Library Account to use all library services. UC San Diego librarians are available to help with your research needs. Chat 24/7 with a librarian now! Get Started with Library Research! Not sure how to begin your research? This guide will give you all the information that you need to begin your project. Find what your instructor has put on Reserve. This guide is designed to help you start your Sociology research. Use the tabs to navigate this guide, and be sure to scroll down to see the content on each page. Please feel free to email me if you have additional research questions, would like to set up an appointment, or have other sources to include in the guide. Most of our e-journals and databases are restricted so that only current UCSD faculty, staff, and students can use them from off-campus. In order to get access to these resources from an off-campus computer, you need to use either of two options: Proxy Server or VPN. Truncation is a search technique that broadens your search to include various word endings. To truncate your search terms, replace the word ending with an asterik *. Limits provide database-specific recommendations for narrowing a search. Applying limits will filter out results that don’t meet your search requirements. This will save you time because you won’t need to look through pages of search results that don’t include the information that you need Each database offers different limits. Be sure to check them out to see how they can help you with your search. For example: In the database, Historical Abstracts, you can filter your search results for peer review, publication date, document type, language, subject, etc. It's important to know that databases use subject headings to organize their articles. When you know the right subject headings for your topic, you can search more efficiently. Starting out on a new topic, you won't know the subject terminology. A simple way to find them is to start with a keyword search. When you find an article title that meets your needs, look for the subject headings assigned to that article. In most cases, those subject headings are hyperlinked and will take you to a list of articles with the same subject heading. Scholarly articles often have extensive bibliographies, also called reference lists or works cited pages. Bibliographies include references to articles, books, and other relevant literature that were published before the article. 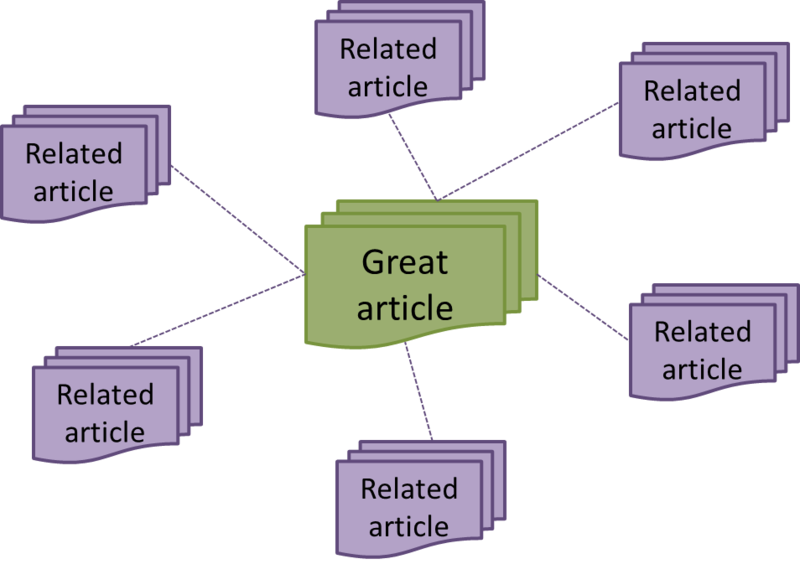 Some databases provide links to the cited references so that you can look at those articles as well, which might provide more articles for you to use in your paper. 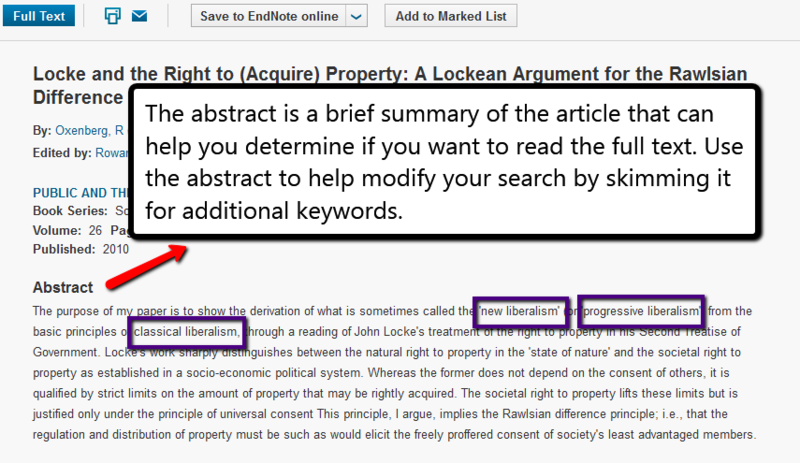 Cited References can help you find articles that are older than the one you are reading. Look at the example to the left. If you found a relevant article from 2003, you could look at the articles in the bibliography to see where your article got the information used to support their main points. These older articles can also be useful to your research, especially if you need to write a literature review. You can use a similar method to find newer articles, by looking at the articles who have cited your 2003 article in their bibliographies. To find out more about this method, see the tab for Times Cited references. Some databases, like Web of Science, include times cited references. Think of these as the opposite of a bibliography. Where bibliographies include references that are older than the article, times cited references are newer than the article. Times Cited references can help you find articles that are more recent than the one you are reading. Look at the example to the left. Let’s say your professor doesn’t let you include references in your paper that are older than 2005. You are finding articles about your topic, but they are all too old. Even the best article about your topic was published in 2003. 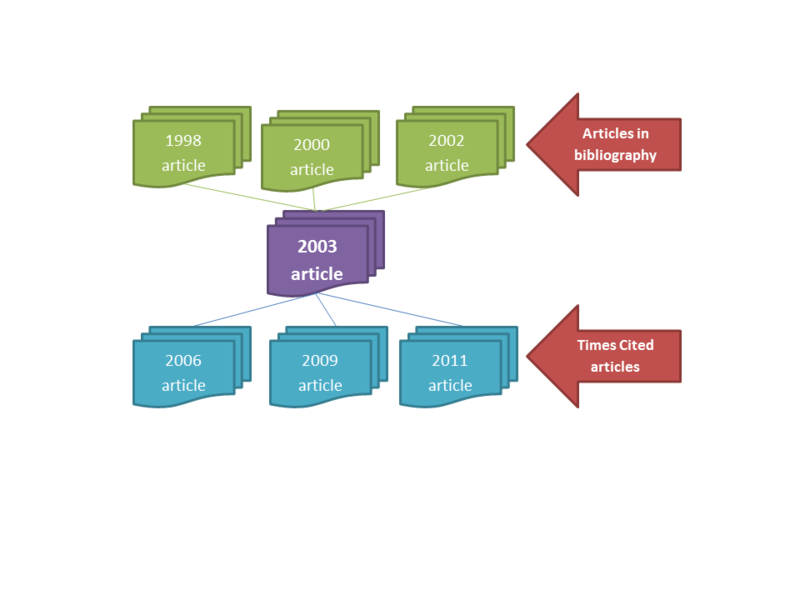 Using times cited references, you could see which articles have cited the 2003 article. Chances are you will find one published a more recently that you could use for your paper. When you find an article that you think will be a good to use, you can take advantage of “related articles” to find similar articles. Databases have different formulas for determining how an article is “related,” but it usually is a combination of same keywords and descriptors. You can usually find a list of related articles on the results screen of the database.